WHAS reporter Melinda Morrison interviews Robert Parker for the Louisville Tonight show. 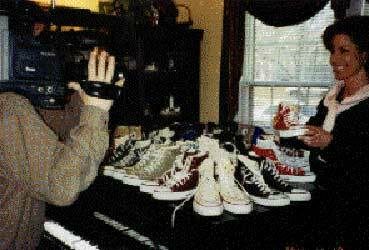 WHAS television of Louisville, Kentucky featured a local man who owns 44 pairs of Converse Chuck Taylor sneakers. Melinda Morrison, reporter for the new magazine show Louisville Tonight, interviewed Robert Parker in February of 1999 after a newspaper columnist mentioned Robert and his sneakers in his weekly writings. The segment on the Converse sneakers was aired in March of 1999. The sneakers, most commonly referred to as “chucks” by the male baby boomer generation have been in production since Marquis Converse began manufacturing the shoes in the early 1920s. The style has remained virtually unchanged over the decades. Robert’s collection has grown to a whopping 44 pairs. He credits the growth of his collection to winning fierce, competitive bidding on eBay auctions on the Internet. His collection began by acquiring a pair of size 17 black high top Chuck Taylor sneakers. Size 17 is the largest Chuck Taylor sneaker manufactured, so it turned out to be the “most fitting” shoe to begin with. Adding to his inventory, he has one pair of the sneakers in red and green Christmas plaid, complete with wreaths on the ankle patches and bells attached to the back seams. A second pair worth mentioning is a pair of white canvas high tops designed in a tiny, Santa Claus print pattern. The sneakers haven’t always been manufactured using canvas. Three pair in his collection are made of leather. Two more contemporary styles of chucks are classified as black and white leather Jewels. This particular style is separate from the traditionally styled chucks because the leather chucks are designed with a three dimensional ankle patch, which is on the outside of the sneaker instead on on the inside, Also included in his collection of novelty chucks are the patriotic Stars and Bars, using images from the American flag, and the 1996 Olympics Flags of the Nations models. Melinda shows off her new pair of red chucks.